They told their stories, and the ripple effect never stopped. Stay-at-home moms inspired corporate execs. Victims of abuse inspired start-up entrepreneurs. Entrepreneurs who lost, and then found, their way inspired students. Cancer survivors inspired everyone. I didn’t grow up with sisters, but, I got over 100 sisters last year. These incredible women who told their stories to help the next generation, and each other, are my Everyday Revolutionaries. But, I STILL remember that feeling…sitting there in my office, writing my first blog post, and not seeing ANY of that. It’s sort of how I feel now. I should be writing a book, I should be getting more nominations for the Hot Mommas Project 2010 case competition, I should, I should, I should. So, once again, I humbly turn to my invisible…yet not so invisble…audience. Here is my idea for my book. I have lots of people ready to run with this and help me when I finish my outline, which I never seem to be able to do. (Who is helping me? Aside from friends’ connections to book agents, I have to give MASSIVE shout outs to pitch and media experts Sam Horn, and Marc Silverstein). Enduring message: Here is HOW to do it based on how Hot Mommas do it (life, career, etc.). Hear it straight from the mouths of your sisters, friends, mothers, and aunts…because we care. Oh, yeah, and we also want you to rule the world. The largest library of teachable role models in the world (they taught, we listened, and now we bring those lessons to you). Cutting-edge, inside-look research detailing the practices of hundreds of driven AND happy women. Highlights from the award-winning Women’s Entrepreneurial Leadership class at the George Washington University School of Business. Author: It is I, your humble So-You-Think-You-Can-Dance-watching, kid-chasing, husband-raising, coffee-drinking author who also happens to have a Harvard MBA, teach college students, and have an illustrious career (entrepreneur and former corporate wheeler and dealer and nonprofit executive in the aging sector). In the “for what it’s worth” category I am a DC Twitter Elite, write for Maria Shriver Women’s Conference site, and have been dubbed “one of the nation’s top business bloggers” by HSM’s World Business Forum. Bio link. If you choose to believe the above, please read on … we’re almost to the good part. Foreward…Hopefully by one of the Hot Mommas extremely impressive judges from 2009 or 2010. Intro: Who is a Hot Momma? Hot Mommas think being perfect is boring. Hot Mommas are entrepreneurs of life: Making their own rules, and finding their own way, and having the self-confidence to do that. And the number one trait of a Hot Momma that distinguishes her from all others? A Hot Momma helps her sisters. She learns, and doesn’t stop there; she pays it forward so that others may learn. Major steps in becoming a Hot Momma (in the book, I plan to use Sam Horn’s IDEA framework: I = Idea, D = Detail, E = Example, A = Application). 1. Self confidence – First, a Hot Momma must believe she can do it. Tips for building life-long self-confidence are discussed in this section. “Grey boxes” (fun stats) will include research showing the self-confidence differential between women and girls, and our male counterparts. Resources: Examples of Hot Mommas who have been through the self-confidence building process, how they did it, and links to templates and tools. 2. Idea generation – A Hot Momma’s GPS is constantly on the lookout for the intersection of “Passion Ln.” and “Idea Ave.” When those two meet, BINGO. But, the Hot Momma also knows that the journey is part of the trip. Grey boxes: Stats on idea creation, and neurological information on women. Resources: Examples of Hot Mommas who have been through the idea generation process and how they did it. Mind Mapping, Opportunity Recognition, and Passion Inventory exercises used in GWSB’s award-winning Women’s Entrepreneurial Leadership class are included. 3. Okay, that was too many ideas – Focus, implementation – Sometimes, the brain of a Hot Momma is in overdrive. There can be ideas, then too many ideas. There can be to-dos, but then too many to dos. This chapter focuses on how to reign in the brain of the Hot Momma, and use its power for good…using…”The F Word” (FOCUS). Grey Boxes: Stats from Hot Mommas Project mentor survey on traits for success, including focus. Resources: Examples of “master focuser “(is that a word?) Hot Mommas, their tips and tricks, and a daily action-plan template. 4. Stocking the toolkit – Key tips for women only, communication, negotiation, and more. Did you know that women engage in certain behaviors (by accident) in communicating and negotiating with people, bosses, roommates, etc? This chapter deals with the most important things Hot Mommas try to improve on to get out there and take on the world. Grey Boxes: Statistics on communication, negotiation, resulting salary differentials, and other key facts. Resources: We draw from outside the Hot Mommas Project data pool for this section as most women don’t even KNOW they are engaging in these behaviors which impact their success. 5. 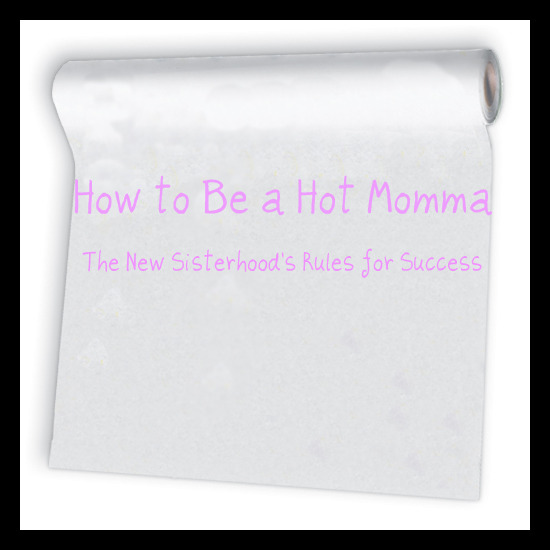 Be a game changer – Hot Mommas are entrepreneurs because they have to be, they are miserable where they are, or they hear the distant call of “Passion Ln.” and “Idea Ave.” However they became entrepreneurial, Hot Mommas just ARE. At home, at work, in their communities. They take the pieces of the puzzle and don’t just put them together WELL, they put them together DIFFERENTLY. Grey Boxes: The Hot Mommas Project literally created the data set on women as game changers. We reveal our previously unpublished data, and compare it to existing “traditional” data which shove women into traditional categories (part-time, full-time, etc.). Resources: Case studies on game changers from the Hot Mommas Project survey and case library will be highlighted. Tools and templates on “how to be a game changer” will be included. 6. Balance – This is high on the radar screen of women and families everywhere. We take on the concept of balance with three critical topics: Perspective, Organization, and Delegation. Many women treat balance as if it is an end in and of itself. The evolved Hot Momma treats balance as a MEANS to an end. Something to achieve, and move on, so that they can get onto number 7, back to number 3, or go rogue with some other activity like bathing. The topic of managing expectations (self, and others) is also addressed. Grey Boxes: Former Harvard Business School Professor and Assistant Secretary of Commerce Dennis Hightower states: “A good manager can make decisions with between 40 and 70 percent information.” We apply this statistic to balance, encouraging women make sure that achieving balance is a hurdle, not a brick wall. We validate womens’ concerns about balance by revealing data on dual income couples, and common responses and attitudes about balance from our Hot Mommas Project survey and previously unpublished “Balance Snapshot” database. Resources: Tips from Hot Mommas Project “Master Balancers” – the top 10 percent of our survey-takers who are highly driven, and highly balanced both personally and professionally. If they can do it, we can do it. 7. Mentoring and support systems. Hot Mommas not only HAVE mentors, they ARE mentors. Hot Mommas have an internal call to action that leads them to pass on their learnings to others both formally (through the Hot Mommas Project and other outlets) and informally. They mentor, because they have been mentored. Hot Mommas have a large support network, and are more successful because of it. Grey Boxes: Hot Mommas Project research on the hierarchy and scale of support networks will be shared. Resources: A Five Minute Mentor template will be shared that can be used with mentees, mentors, and at work or at home. Did you know your whole family could serve as a mentor? Learn how in this chapter. Thank you for reading. The last step is to fill out this poll (I’ll use it in my book proposal!). Thank you, again. Want to get involved with the project? Go to www.HotMommasProject.org and NOMINATE a dynamic woman you know to share her story, and help the next generation. Winners of our annual case study competition will be published in a major Prentice Hall Textbook. Here is our 2010 press release.